Captain Nearo Shadowbane stood in front of his Marines, all covered in soot having just arrived from the portal linking the Temple of Elune to Stormwind Keep. 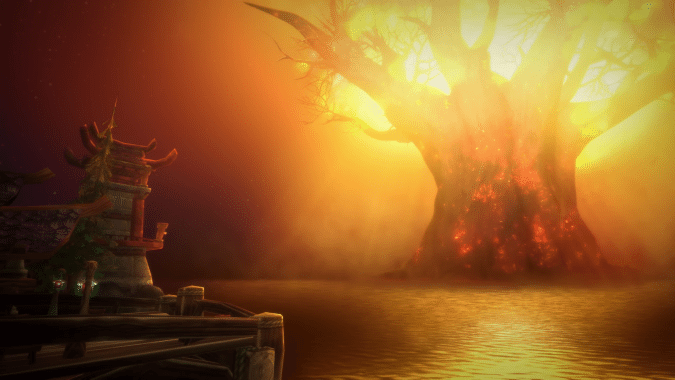 They had aided the Night Elves and Gilneans evacuate as many as possible from Teldrassil... but it was not enough. More were pouring into Stormwind Keep from the portal - some barely clinging to life. A sickening mixture of anger and disgust wore heavily on the Captain as he turned to address his Marines. "These fools should have listened to Admiral Proudmoore!" as he pointed towards the panicked Alliance leaders standing on the other side of the throne room, discussing what to do next. "They said he was stuck in the past, yet the Horde has proven time and time again that the opposite was true - he was a man of Vision." Nearo continued, the anger in his voice sharpening with every word. "He knew what a future alongside the Horde looked like! Take a look at it now, Marines!" he shouted, pointing at the flood of injured and burned refugees pouring through the portal. He continued, his voice lowering with a simmering intensity. "A future alongside the Horde didn't mean peace. It didn't mean shared prosperity. It meant the destruction of our homes, the ruination of entire kingoms and the genocide of the peoples who were already here when those greenskinned savages were scratching around in caves on Draenor.... killing one-another before committing genocide against Draenei.... and ultimately destroying their own world." Behind him, a small crowd had begun to gather... they were listening intently. Nearo could see heads nodding in agreement as he continued. The captain turned to address them as well, his Marines still standing at attention. "Now they are here, destroying ours! These animals will never change - and we must never stop fighting them until every single last one of them is dead!!!" The small soot-covered crowd errupted in rabid cheers. They were ready for war. They were finally ready to do what must be done.